This report, released on January 29th 2019, was made by human rights defenders in Sierra Leone, concerned for the detention of activists and the death of two people who sustained gunshots from allegedly the state security personnel acting to protect the SOCFIN Agricultural Company on January 21th 2019. >> Download the complete Report. Member of the mission with an affected community. >> Download the complete Report. 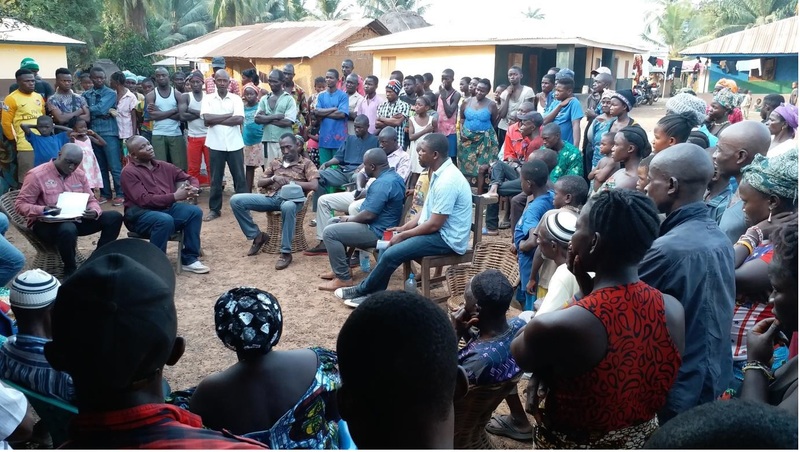 While the Government of Sierra Leone had promised the affected communities in Malen to resolve the land conflict that has been raging in the Chiefdom since SOCFIN’s arrival in 2011, recent violent incidents are of concern to the civil society organisations that are publishing this report. Following the arrest and detention of land rights defenders belonging to the land rights activists group known as MALOA (Malen Affected Landowners Association) in Malen Chiefdom (22/01/2019), proponents of land rights across the country expressed concern for not just the detention of MALOA members, but also for death of two people who sustained gunshots from allegedly the state security personnel acting to protect the SOCFIN Agricultural Company (21/01/2019). In order to get first-hand information, a fact finding team was speedily put together with the mandate of visiting the affected communities to conduct an assessment. The fact finding mission was held from 24th to 27th January in Pujehun district, Malen chiefdom and surrounding areas. This report looks back at the background of this conflict, summarizes the situation of the events of the 21st January and the following days, specifies their impact on the human rights of communities and defendants, outlines the findings and makes recommendations to the stakeholders (GoSL, SOCFIN and the international community), who must act immediately as a matter of urgency. Our main findings are as follows: two people were killed during a conflict that served as a pretext for the joint security operations – MACP – (with the support of SOCFIN) to raid in villages of nine sections, to use excessive force, beat villagers and MALOA members, to loot and vandalise properties of communities and to intimidate and arbitrary arrest activists, in particular the members of MALOA (fifteen people including Honourable Shiaka Sama, Member of Parliament). These incidents have created an unprecedented climate of tension and fear in the Chiefdom, which has forced hundreds of people to flee their villages. We urge the Government of Sierra Leone to, among other steps, investigate these violent incidents, release those arbitrarily arrested and detained, ensure the protection of Malen communities and MALOA members, provide support to internally displaced persons, en generally, in relation to the existing land conflict, facilitate a long lasting peaceful resolution of the conflict. >>> Download the complete Report.